If you're not sure where to start, start with the collection! There are so, so many readable, fascinating nonfiction picture books on our shelves. I knew I wanted to feature some in this program. 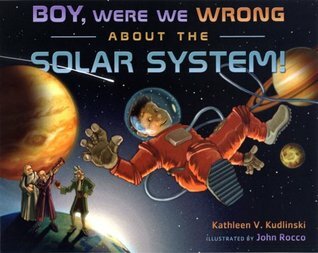 I knew I wanted to do a program on space, and one book jumped out at me: Boy, Were We Wrong About the Solar System by Kathleen Kudlinski. I decided to focus my program around how scientists have and continue to study the planets. After the readaloud, I had put together a Prezi with information (and lots of photos) about different spacecraft that have been developed to study the planets. We talked about Voyager I and II, Sojourner, Spirit & Opportunity, Curiosity, and Juno. We talked about the designs of Sojourner and Spirit/Opportunity and what was the same and different. I included fun facts like the fact that Curiosity was named by a 12-year-old girl (as part of her prize for winning the essay contest, Clara Ma got to sign Curiosity during assembly!) and I included photos taken by the Voyager spacecraft and by Spirit and Opportunity. I had a slide showing the Curiosity's Facebook page. The readaloud and Prezi took about 30 minutes. I tried to keep both very interactive, asking the kids questions as we went through to keep their interest. All the kids who attended were eager to be part of the conversation and I love that they're so curious! The table set-up for our hands-on activity. After all this information, we did our own experiment. NASA has created an activity guide called Explore: Jupiter's Family Secrets and we did the activity called "Investigating the Insides". For this activity, you fill dark-colored, opaque balloons with a variety of materials and provide tools for the kids to do tests and try to guess what's inside the balloons. I filled balloons with buttons, paper clips, magnets, feathers, pom poms, or beads and provided the kids with a scale, magnets, and magnifying glasses to explore their balloons. I put the kids into pairs (and I had one group of three). Of course, the kids pretty quickly held the balloons up against the light and could fairly clearly see what was inside them, but they still enjoyed using the materials to do the tests. After the kids had spent about 10 minutes exploring their "planets" and writing down their guesses for what was inside, they each popped their balloon and told everybody what was inside. Then we talked about how the tests they did were the same or different to tests scientists might be able to run on planets. Astronomers can't pick up a planet and look inside, shake a planet, or weigh a planet. But they can take photos and do magnetometer tests to get a clue about what's inside! Of course, I provided a book display of related books and DVDs and I put together a handout with links to the websites I used to find the information (and other fun space websites). I had some helpers for my program. One of our regular patrons is a high school science teacher and she and one of her students came to lend me a hand. It was great to have them there to chime in during the presentation and to go around while the kids were investigating their "planets" to ask them questions. All in all, this was a super fun program with a great group of kids and parents. I'm excited already to do my next STEM program! Need more STEAM programming ideas? Amy at The Show Me Librarian has some great posts about STEAM programs and ALSC's online class STEM Programs Made Easy will be offered again later this spring. ALA Youth Media Awards Announced!! !